Hot Dogs and Beans is one of our favorite dinners. It's comfort food. It's a quick and easy dinner to throw together. It can also be a cheap meal to throw together when combining sales and coupons. When I worked, we ate hot dogs and beans almost once a week. At that time, we were more concerned with convenience than frugality and didn't bother to wait for a BOGO sale on hot dogs. We just bought them, usually at full price, whenever we wanted a quick dinner. I was also a sucker for those little recipe magazines at the check-outs of the supermarket. For a while, I was buying several of those little books a month. I guess that was before I realized that a foodie could find a recipe for almost anything on the internet! It was definitely before Pinterest! The recipe I am sharing today, I first found in one of those little magazines. 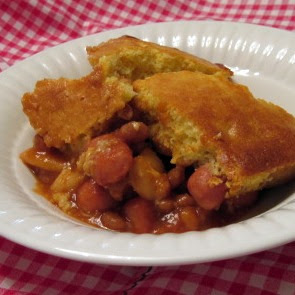 It's a casserole made of hot dogs and beans, topped with a layer of cornbread. Mmmm! In a large sauce pan over medium heat, stir together the beans, dry onion, brown sugar, ketchup and mustard. Transfer to an un-greased 9x9 casserole dish. Spread the prepared corn muffin batter evenly over the top of the bean mixture. Pop the dish into the oven and bake for 20-25 minutes or until topping is golden brown. You can easily use your favorite homemade baked beans in place of the canned beans in this recipe. I usually use 6 cups of Our Favorite Baked Beans, but was out of them when I prepared this meal this week. Raw onion also works well in this recipe. I was in a hurry tonight and didn't feel like dealing with chopping a raw onion, so I used the minced onion from the spice rack in our pantry. I don't always have the mini hot dogs on hand. I find that regular hot dogs go on sale more often, so that's what I usually use. Today, I used the mini hot dogs that were in the freezer, but when I don't have them, I simply slice regular hot dogs into bite sized pieces and add them to the bean mixture. It looks so yummy! Great blog and lovely recipe! Thanks for sharing.